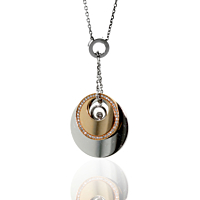 A sublime blend of brilliance and class, this 18k White and Rose Gold necklace from Chopard's Happy Diamonds collection would make a perfect addition to any wardrobe. Its stylish combination of contrasting Golds evokes a sense of youthful artistry, while its multitude of Round Brilliant Cut Diamonds are a testament to Chopard's world-famous perfectionism. 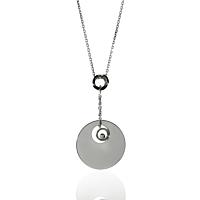 With a comfortable 16" length and stand-out 24mm pendant, this necklace can add a touch of glitter to any refined outfit, from a demure evening gown to a cute cocktail dress.